Rebels in Sudan's Darfur province say they have released 49 African peacekeepers they accused of entering their territory without permission. The Justice and Equality Movement (Jem) rebels say they have also freed three other people they had suspected of being Sudanese security agents. 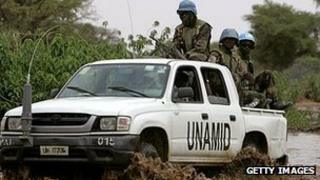 The joint UN-African Union peace force (Unamid) had said the soldiers would not leave without their colleagues. Unamid says the three are a Yemeni policeman and two Sudanese translators. Jem said that most of those held on Sunday night were Senegalese Unamid troops but there were also soldiers from Ghana, Rwanda and Yemen. It said it released the final three after investigations showed they were not security agents. However, Unamid commander Patrick Nyamvumba told the BBC that it took a "show of force" to convince the rebels to free them. Senegalese troops operate mainly in the north-west of Darfur, near the border with Chad. The BBC's James Copnall in Khartoum says the incident highlights the lack of stability in Darfur. Fighting has died down since 2006 but three rebel groups are still fighting the government and Jem is the strongest of the three. Our correspondent says relations between Jem and Unamid have recently deteriorated. He says Jem has accused Unamid of supporting a reserve police force which Jem accuses of carrying out atrocities in Darfur. Jem says Unamid supplied the force with cars. Two million people are in refugee camps after nine years of conflict in Darfur. The government in Khartoum puts the figure at about 12,000 deaths, and says the number of casualties has been exaggerated for political reasons. Sudanese President Omar al-Bashir is wanted by the Hague-based International Criminal Court for genocide, crimes against humanity and war crimes in Darfur. He denies the allegations.